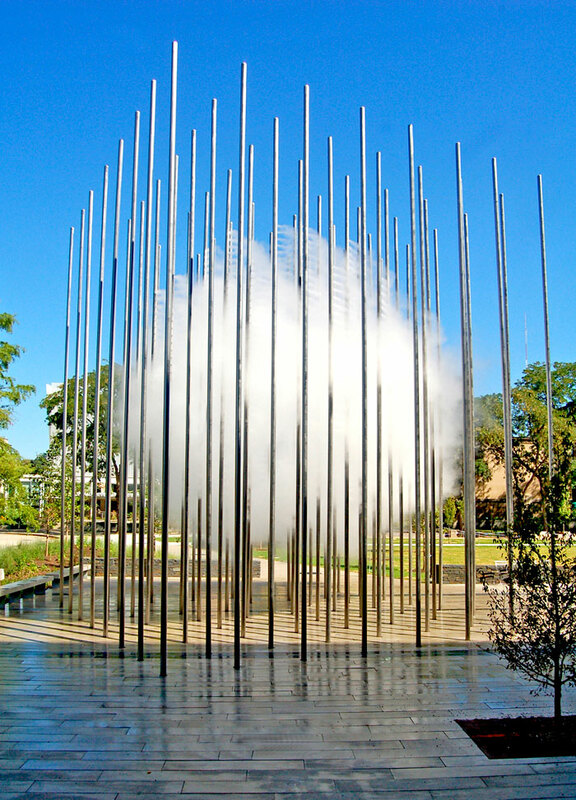 embedded in the 30-foot-tall poles convert water into a cloud that appears and vanishes every few minutes. PHOTO Courtesy of Ned Kahn. Environmental artist Ned Kahn ’82 (CLAS) creates massive kinetic sculptures that mix natural elements, such as wind, water, and even fog, with the structural. He has more than 100 such installations around the world including this, the “Cloud Arbor,” in Buhl Community Park in Pittsburgh. Kahn describes the 2012 collaboration with landscape architect Andrea Cochran and the Pittsburgh Children’s Museum as a sphere of fog that forms inside a forest of stainless steel pipes. High-pressure fog nozzles embedded in the 30-foot-tall poles convert water into a cloud that appears and vanishes every few minutes.